This article has been written by Dr Jonathan Brown and is general advice on treating acne. Cityskin does not offer treatment for acne but we realise that it is a common problem and we love to help. Please see your GP or a dermatologist for treatment. Acne is a common cause of spots and most commonly affects people aged 12-25. It occurs in all skin types in males and females. Acne can be treated and, as a Doctor, I like to treat it to prevent acne scarring. Treatments don’t need to involve expensive creams – there are simple, effective treatments available from your local GP. The word ‘acne’ is derived from the bacteria that is often present within spots- propionibacterium acnes. 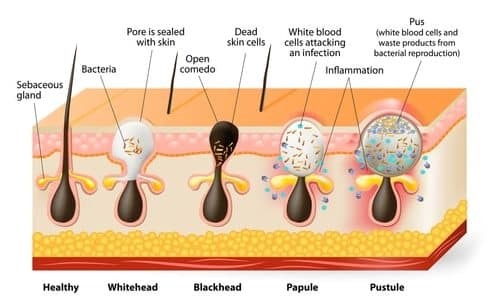 The diagram above shows how acne can form. On the far left of the diagram you can see a sebaceous gland within a hair follicle. Sebaceous glands are present all over the skin and have the function of producing sebum – an oily substance which lubricates the hair and skin. As we approach puberty, and with hormonal changes, we start to produce more sebum which can make the skin feel oily or greasy. An increase in sebum production combined with dead skin cells and a buildup of bacteria can cause inflammation inside the hair follicle and cause pus to gather. This leads to whiteheads, blackheads and pustules – all forms of acne. Some medications can make acne worse. The mini pill (progesterone only pill) and the Implanon/contraceptive injection can worsen acne. Anabolic steroids and some epilepsy medications can also cause acne. Squeezing spots can lead to more inflammation and can cause scarring so we always advise patients to avoid squeezing. Medical conditions such as polycystic ovarian syndrome (PCOS) and other conditions where the level of testosterone in the blood is higher can cause acne. As a GP I always try and find a cause of acne so I take a full medical history. In females we look for common conditions such as polycystic ovarian syndrome (PCOS). A 2012 article by the Royal College of GPs estimates that between 12 and 21% of fertile women in Australia may have PCOS. The full article is available here. Medical treatments for acne are broken down into topical treatment (creams/lotions) and oral treatments (medication). Cleanser – if you have oily skin you may want to consider a cleanser. You don’t have to spend a lot of money on this as simple cleansers such as Cetaphil for oily skin works well and isn’t very expensive. Retinoids (vitamin A) – these creams are great at reducing acne in the spots and opening pores. Retinoids are not safe in pregnancy. Epiduo – this is my favourite cream to treat acne as it combines benzoyl peroxide and vitamin A. 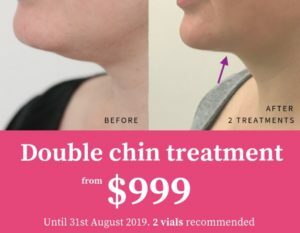 It is also subsidised by the PBS for the treatment of acne making it cost effective. ‘The pill’ – in females there are 2 contraceptive pills that can reduce the hormones that cause acne : Yasmin/yaz and Dianette. It is a prescription medication available from your GP. Other contraceptives can make acne worse so discuss your contraceptive with your GP if you have concerns. Antibiotics – I like using doxycycline or minocycline antibiotic. It kills the bacteria that causes acne and is fairly cheap on prescription. Doxycycline can make your skin more sensitive to the sun and you have to be aware that taking it can interfere with the effects of the contraceptive pill for the first 6 weeks. Spironolactone – also known as ‘Aldactone’. This is actually a blood pressure tablet but has the side effect of reducing the hormones that cause acne. Discuss this with your GP as this may a treatment option available to you. Acne is a common condition and affects all skin types. It can be treated well by using medication so you don’t have to suffer. See your GP or dermatologist to discuss acne treatment.